Edie the Salsa Freak – world-renowned dancer, choreographer, Salsa instructor and dynamic business woman, brings you the latest installment in her “World’s Greatest Leads” series of Salsa Instructional DVDs. This time, Edie is partnering with Clem Stanyon, an Australian-born Salsero who lived and danced in the US for a decade before returning home to Australia. Clem brings a unique take on Salsa, being both a dancer and a biologist, with experience in both Ballroom and Street Latin styles of Latin dance. In their Elegant Moves DVD, Edie and Clem demonstrate a multitude of figures for all levels of Salsa dancer – beginner, intermediate and advanced – plus share choice insights into the fundamentals of becoming a great Salsa dancer. 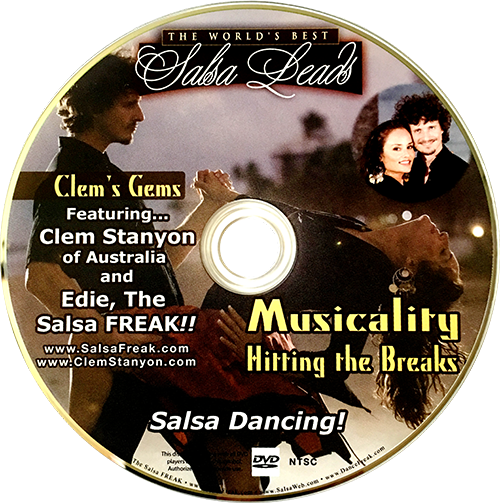 In addition to the Elegant Moves DVD, Edie and Clem bring you a Musicality DVD; one of the things that impressed Edie most about Clem when they first danced was his ability to adapt his dancing to the changing phrases of every song to which they danced. They explain what elements to listen for in Salsa music that allow a dancer to anticipate when breaks are coming, and show a great variety of ways to mark the breaks. One of the things that impressed me most about Clem when they we danced was his ability to HIT THE BREAKS and adapt his dancing to the changing phrases of every song to which we danced. When the music paused, Clem paused… when the music sped up, Clem sped up… when the music got romantic… Clem got romantic. … and when the Music hit the break HARD, CLEM “hit the break”… SHARP and PRECISE! In this fantastic Musicality DVD, we explain what elements to listen for in Salsa music that allow a dancer to anticipate when breaks are coming. In addition, we show a great variety of moves you can use to mark the breaks – dips, checks, lunges and drops. Have you ever wondered how many hand positions or combinations there are in Salsa, or at the numbers of basic cross-body forms? This DVD has the answers. In their Elegant Moves DVD, Edie and Clem demonstrate a multitude of figures for more developed Salsa dancers – intermediate and advanced – plus share choice insights into the fundamentals of becoming a great Salsa dancer!